Believe it or not, here at Misty Hollow, we very often go to show with a very small car. Let's face it; this day in age, gas mileage is a necessity and almost a luxury. Once upon a time, Jen was a rally car driver who fell in love with small, Asian made cars for their reliability, handling, and excellent gas mileage. She also realized that such small cars, when packed properly, could hold quite a bit of luggage! If you think that your vehicle is too small for shows, that may not necessarily be true. Proper packing is a MUST, mostly for safety reasons (yours and the buns)! Here at MHF, the vehicle of choice is currently a 2009 Hyundai Accent 2-door hatchback. While this may seem small, it is actually the perfect starter vehicle for bunny shows! The rear seat folds down in 2 sections, so stowing a lot of gear is very easy. First and foremost, I can't stress enough that bunnies must ride in a proper rabbit carrier. At every show, I do see a novice breeder or two that brought a single rabbit in a kitty carrier. Most often,this breeder will find our local vendor selling inexpensive bunny cages and buys a bunny carrier for the return trip home. The bunny is safest and happiest in a bunny carry crate, and at least at the New England shows, our vendors have good quality carriers at all times! At a minimum, we take 3 rabbits to show. Since French Angoras often need extra equipment, the car always looks full. We always bring a grooming table, a blower, food and water for the rabbits, a toolbox for emergencies chairs for human comfort, and other sundries on our journeys. This article will illustrate how WE pack for shows. First, the grooming table is loaded. The table table that we take to shows has been custom made to take up the least amount of space possible. Two folding chairs (the cloth kind that fit into a bag) sit on the rear floorboards. We have a small file box that carries pedigrees, paperwork, business cards and the like that rests within the table top. Under the table top, the "bunny suitcase" is packed. The bunny suitcase is an old airline carry-on that can hold a toolbox, a sheet to protect the rabbits from sun, and various other things. Also within the table top, I sit a small wire mesh wastebasket that holds a thermos of bunny water, an extension cord, and a few of those plastic bags you get at the grocery. I place my grooming blower next to that. At the rear of the car, I place the bunnies. I use 3-hole carriers made by PHF Cages. I have 2 3-hole carriers strapped to my 'bunny cart' which consists of wooden carts that we made to fit the bottom of the carriers. I had to allow for some room between carriers, since I spoil my buns and leave water bottles hung on the outside of the carrier cages. Other breeders don't give water in transport, and I can't fault them. It is a personal/bunny preference. I do have one buck that goes crazy if he doesn't have a bottle, so it's easier for me to just give him and his friends what I call 'carrier bottles' which are 4 ounce Lixit bottles. Mine hang outside the carrier for short trips, but I will place them inside for longer hauls. Remember that thermos? That's for bunny water! I have had a couple of horses that would never drink strange water, so I didn't want to figure out which bunnies wouldn't either! At the rear of the car, I place the bunnies. Due to the funny nature of the car, these particular carriers fit between the trunk part and the seat part with fractions of an inch to spare! There is no where for the buns to roll or slide. This really was a happy coincidence! If I have more than 2 carriers, (I can fit up to 4 3-hole carriers) the remaining carriers fit on top of the lower carriers. I also always make sure to bring one extra (empty) single hole carrier, in case I come home with an extra bunny. MOST IMPORTANT: I have found that it is best for bunnies to ride facing the side of the vehicle. THIS IS FOR SAFETY REASONS. If a bunny rides facing the headlights of the vehicle, a sudden stop could be deadly. When the bunny rides facing sideways, his whole body is available to help him absorb the impact of sudden movements. Just this weekend, I was writing for a judge when a breeder placed a beautiful English Lop on the table. The rabbit was DQ'd for a freshly broken tooth. The poor breeder was instantly worried; she was certain the rabbit had been OK that morning. The judge gave the breeder advice on how to trim the teeth in order to help them grow back properly (WOW, what a good judge she was to see the difference between a break and pulled tooth!!!) when I asked how the rabbit was loaded in the vehicle. Without skipping a beat, this judge (did I say she was AWESOME?!?) went on to tell the breeder that the animal industry has found that most animals, especially horses, traveled better sideways! The Lop (GORGEOUS, I may add!) and his bunny mom left the table a bit discouraged about the DQ, but very relieved that the rabbit would be OK very soon. Please do make certain that your bunnies travel safely at all times. I hope you've found this article enlightening. If you're just considering going to your first bunny show, WELCOME!!!!! The rabbit show community is always here to help, answer questions, and make new friends. Misty Hollow Farm looks forward to seeing both old friends and new at the next show! 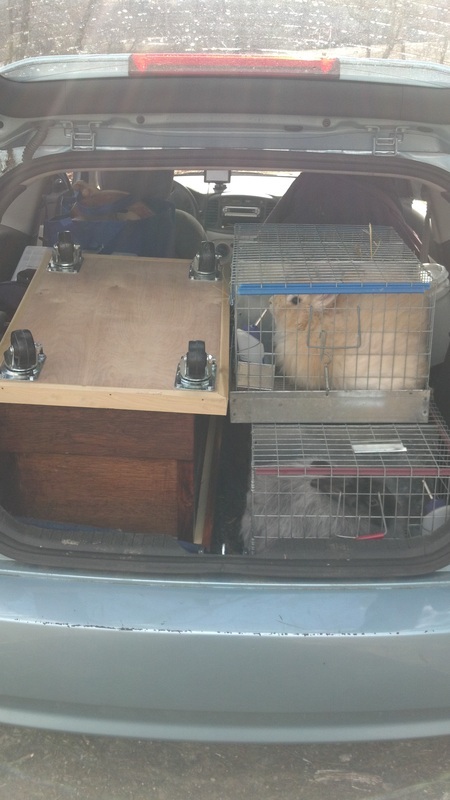 Bunnies and equipment loaded for the trip to the PSARBA Mini Convention in February, 2013.